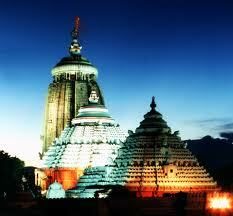 The Jagannath Temple in Puri is a famous Hindu temple dedicated to Lord Balabadra,Devi Subhadra,Lord Jagannath. It’s located in the coastal town of Puri in the state of Odisha, India. The name Jagannath (Lord of the Universe) is a combination of the Sanskrit words Jagat (Universe) and Nath (Lord of) and also, the word "Jagannatha" is evolved from "Jagati" (Oriya: ଜଗତି) (as an elevated platform or "Ratnabedi" on which the wooden form of Jagannatha, Balabhadra and Subhadra are worshiped on or the temple or its precincts inside the "Narendra Pokhari") and "Natha" (Oriya: ନାଥ) (means "Lord").The temple is an important pilgrimage destination for many Hindu traditions, particularly worshippers of Krishna and Vishnu. It’s one part of the Char Dham, pilgrimages that a Hindu is expected to make in one's lifetime .The temple was built in the 11th century a top its ruins by the progenitor of the Eastern Ganga dynasty, King Anantavarman Chodaganga Deva. The temple is famous for its annual Rath Yatra, or chariot festival, in which the three main temple deities are hauled on huge and elaborately decorated temple cars called Ratha's. Since medieval times, it is also associated with intense religious fervor. The temple is sacred to the Vaishnava traditions and saint Ramananda who was closely associated with the temple. It is also of particular significance to the followers of the Gaudiya Vaishnavism whose founder, Chaitanya Mahaprabhu, was attracted to Lord Jagannath. He lived in Puri for many years. The temple campus has all the Hindu deities. Lord Balabadra,Devi Subhadra,Lord Jagannath are worshipped as humans. All the daily activities of normal human is being followed at the temple. Food is served to the deities as a human. So, it’s a believe in the people that the deities are a part of them. The Anand Bazar inside the temple premises provides food to thousands of the devotees round the clock. It’s the world’s largest dining & kitchen in terms of providing food in a day.